An information era has changed the way modern people living their life. When the manufacturing-centered industrial economy was introduced  with the electricity and electronics, the hi-tech social life was embraced by our ability to reproduce, replicate, and reshape knowledge. From there, information has become the center of social life. The digital era has made modern living flooded with information. Today is the time where people must handle the largest information ever there since the emergence of our species on the planet . An anticipation of modern science has come to the term of “data science” then, for science not only needed data, but also, data itself has become needy for any scientific endeavors . Thus, the existence of the great amount of data along with computational capacity of our modern times has open a big door on how we see things. The capacity of computational processing has become so fast that a lot of mathematical tasks can be delivered within small amount of time that cannot even imagined by scientists and researchers from centuries ago. An interesting impact of this was celebrated by the foundation of “fractal nature”, a mathematical approach formalized by mathematician Benoit Mandelbrot  showing the revolutionary changes on how geometry should see nature. This mathematical concepts introduce the new kind of “symmetry” of the natural shapes around us, the self-similarity, a kind of symmetry in which the whole has approximately similar shape as one (or more) of the parts . Roughly speaking, this is the kind of concept that made it is possible for computation to express natural object as realistic as what we can discover in nature. While geometry is one of the very foundation of modern science, such notions necessarily has made big impacts on many aspects within modern sciences today . An impact that in some ways related on many pillars of modern life, from animation (e.g. : 3D movies, computer gaming), the way scientists do statistics , to the way we may philosophize what we see within our being as civilized creatures on earth. New arts form have even been emerged by the “movement” of “generative art” . Fractal geometry is probably one of major inquiries in modern times that shape our perspective seeing things since the very beginning of geometry. The understanding of fractal geometry of nature has made people transgressing the scientific boundaries, as mathematician could be also an artist by the inquiries of aesthetic figures computationally, and scientist become mathematician for doing the “math of the natural forms”. Benoit Mandelbrot, in his memoir called himself not as a mathematician, but a “fractalist” , a term which is fuzzily undefined in the tradition of modern sciences since the enlightenment age. Thus, an impact of the “fractal geometry” has demonstrated that there are actually a “different” kind of geometry, which is “strange” enough to the one we know and learn in modern school as in many ways inherited from the root of Hellenistic academia. This has teased the scientific mind while Indonesian people, and of course the major eastern civilizations, saw what they have inherited from the past time, the civilization that somehow quite separated from what is rooted in the west. One of the mind-teasing is the research reporting the observation of Indonesian traditional batik in the eyes of computational fractal geometry . The fractal geometry on Indonesian traditional batik have witnessed that some old motifs were drawn within as an iterated functional system by deconstructing the “pseudo-algorithm” employed in its making and designing process . Unlike western “geometer” in the dawn of the renaissance , for instance, the way Indonesian traditions do paintings in a kind of generative art by transforming the image of nature into their canvas. Traditionally, the craftsmen are fractalist, they do not employ the geometry as we know in modern times. Traditionally, Indonesian people also recognize that most of Indonesian old batik have thematic named represented by the motifs. Thus, the place of batik within Indonesian traditional culture is the matter of paintings. That is probably, we are rarely discover narratives within two dimensional objects in Indonesian traditional culture that is regarded to be paintings similar with their western counterpart, despite many statues with great detail discovered. By celebrating modern computation, another appreciation on the beauty of Indonesian traditional batik is thus revealed. However, the new philosophical inquiries come forward. Without geometry as known in modernism, the people in the archipelago have inherited so many cultural forms that is quite strange to the modern minds. Just like the Indonesian batik, they were not made with the “standard” geometry, and the fractal geometry shows that the emerging figures are actually related with the themes with what batik paintings are entitled. The way eastern people in Indonesia did geometry is actually different and in “strange” ways with their brothers and sisters experiencing the European enlightenment era. An interesting perspective to realize how the civilization lack of strict modern sciences and the language of modern geometry could built themselves such huge yet great detail and sophistications , like for instance, world heritage temple of Borobudur in the 8th century . While geometry is realized as one of the fundamentals emerging civilization, the way people do their “geometry” would positively reflect the uniqueness of civilizations. Finding the way people do geometry is interestingly would lead into comprehensive way in the understanding on how cultures evolve from generations to generations. By seeing culture as a kind of collective intelligence among people coloring their cultural aspects, be it economy, social, political, and all, then by in-depth observations and the employment of information technology delivered by modern sciences, might help us to see how it is (and philosophically should) gain understanding how it brought advantage to the lives of the humanity today. In many cases, however, many traditional “technology” have already there on the market inspiring modern life, from herbal mixtures used as medicines  to the structural architecture in the area of earthquakes , and not to mention the overwhelming ideas of patterns and designs that beautify our daily appearances, whether be labelled as “ethnic” or even “modern”. In advance, some of them are even now have hit local and global market with the label “creative economics” . The information age, where data has been the inseparable things in our daily life today should now also celebrate the inspiration from collective intelligence coded in the forms of heritage, customs, and traditions among Indonesian people within the archipelago. While it can enrich our modern humanity, it will be also important in envisioning the lives of the people in the country , in the more exciting future ahead. Barnsley, M. (1988). Fractals Everywhere. Academic Press. Brotton, J. (2006). The Renaissance: A Very Short Introduction. Oxford UP. Elfahmi., Woerdanbag. H. J., & Kayser, O. (2014). “Jamu: Indonesian traditional herbal medicine towards rational phytopharmacological use”. Journal of Herbal Medicine 4(2): 51-73. Elsevier. Farr, J. R. (2003). “Industrial Revolution in Europe: 1750-1914”. World Eras 09. Thomson-Gale. Lansing, S. J. (2012). Perfect Order: Recognizing Complexity in Bali. Princeton UP. Mandelbrot, B. (1982). The Fractal Geometry of Nature. W. H. Freeman and Co.
 Mandelbrot, B. (2014). The Fractalist: Memoir of a Scientific Maverick. Vintage. Mayer-Schönberger, V. & Cukier, K. (2013). Big Data: A Revolution That Will Transform How We Live, Work, and Think. Eamon Dolan/Houghton Mifflin Harcourt. Pudjisuryadi, P., Lumantarna, B., and Lase, Y. (2007). “Base isolation in traditional building, lesson learned from Nias March 28, 2005 earthquake”. EACEF 2007, Jakarta, Indonesia. Situngkir, H. (2012). 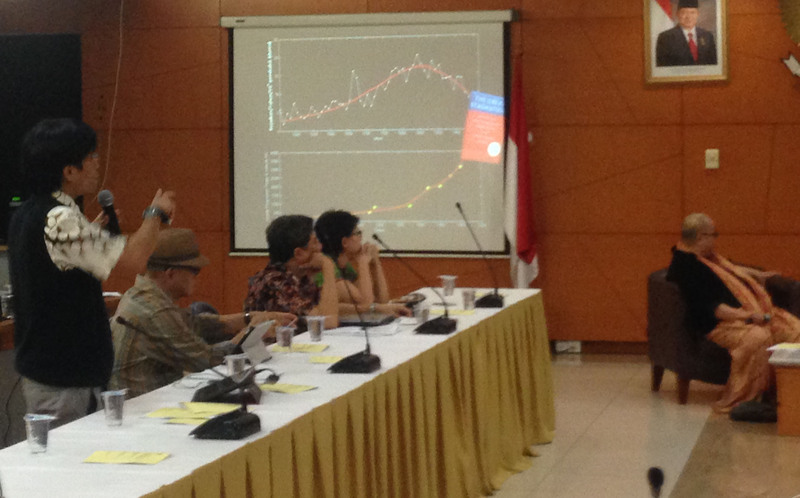 “Computational Batik: the deconstruction and re-generation of Indonesian Batik”. Keynote in Nicograph International Conference 2012. The Society for Art and Science. Situngkir, H., Dahlan, R. M. (2008). Fisika Batik: Jejak Sains Modern dalam Seni Tradisi Indonesia. Gramedia Pustaka Utama. Sprott. J. C. (2003). Chaos and Time Series Analysis. Oxford UP. This entry was posted on September 23, 2014 at 4:50 am and is filed under Uncategorized. You can subscribe via RSS 2.0 feed to this post's comments. You can comment below, or link to this permanent URL from your own site.